Photo compliments of Nathan. 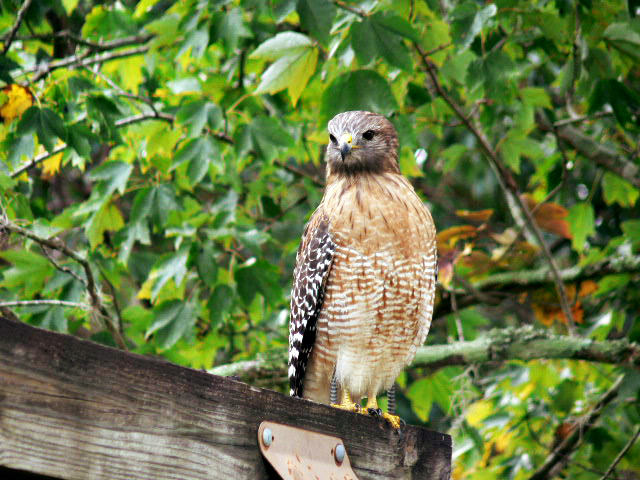 This hawk visits our backyard from time to time. Once we even watched it catch and eat a live snake, but this time it just flew away with a dead rat which wasn't nearly as exciting. No wonder I feel like I live on an episode of Animal Planet! It's been kind of quiet around here this past week. During the quietness, however, we hit a big milestone. Mike and I went out of town for five days and left Wenxin and the other kids with my parents. Wenxin's been home a little over two years, and this was the first time he'd been away from both parents for a stretch of several days. He did great. And my re-entry has been smooth. I've held him a lot and even let him sleep in my bed last night. (Mike comes home on Friday.) I've been pleased to see that he's calm and content and doesn't seem to be thrown off balance by the separation. We kept him very close the first two years. I think our investment in building that bond with him will pay off for years to come. It's a decision I'm happy we made. Let's have another Paint Me a Picture linky party today. 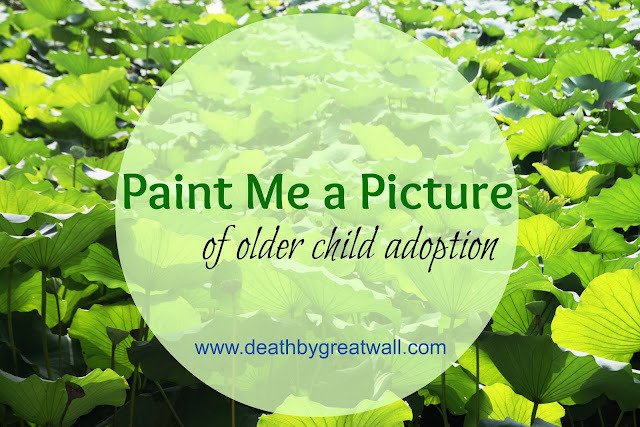 Link to something you've written that helps paint a picture of older child adoption in real life. And don't worry too much about what qualifies as older child adoption. If you have a story to share, we want to hear it. Here's how it works: Use the easy linky tool below to link to the specific post you'd like to share. Then, please link back to Death by Great Wall either by grabbing the button on my sidebar or by placing a text link at the end of your post. Don't have a blog? No problem. Just share your story in the comments section of this post. Are you part of an adoption message board? Do you use Facebook or Twitter? Would you please pass along the link to this post so that more bloggers can join our party? The share buttons at the bottom make this really easy. Thanks! Hooray for smooth re-entries! That's the part I just dread so much about going away. I know what's going to happen when we return, and as a result, I find myself unable to relax while I'm gone. This gives me hope it may get better! I'm so happy about this too. You have every reason to have hope! I just read an article on one of the Yahoo groups detailing the corruption and deception surrounding older child adoptions, particularly of those that are "aging out". As the parent of a teen home just 3 months, these articles are disturbing to me, because they make me question every word, gesture, or action my son makes. Is it "Live" or is it "Memorex"? Is it "real" or a "facade"? Our son's file had some of the red flags mentioned, but so does just about every file I've ever read of children from China. Yes, I believe there is corruption out there. Anytime you mix a commodity (children) and financial gain, you are going to have corruption. We almost let the first article of this nature convince us not to adopt our son. I am glad we were able to put the warnings in perspective and continue with our "eyes wide open". I am glad we have our son. His China file was not truthful. It did not say how he loves to read. It didn't say that he loves listening to piano music and wants to learn to play. It didn't mention his thirst for learning and his curiousity about how things work. It didn't mention his playful, funny, mischievious personality. Even the personal list of questions we sent didn't reveal any of this. His file also didn't say they had no supervision, rules, loving discipline and structure and that adoptive families would have to teach their kids about these things. It didn't say our son wasn't attached to his foster parents and thought parents could "resign" whenever they wanted. It didn't say that they had so little stimulation that computers became their only windows to the world. At some point, we'll ask deeper questions about our son's past, what he remembers, what he was told to expect about being adopted, etc., but not quite yet. He told us recently, when asked why he chose to be adopted, "I just wanted a home..." Faking? Scripted response? Maybe...but then again, maybe not. Thanks for posting, Debbie. I'm crafting a post in my mind about the potential for corruption in China adoption even as I type this comment. What a heavy topic. And yet, one that we really have to face if we want to ever see things get better. Hi Dana! Finally got around to figuring out how to add your button. :) I loved reading your blog when we were in the process of adopting and after we brought John home, and I really enjoy all your posts and links. Sorry I don't comment more often, but know that the work you are doing is so appreciated and I am reading! The article I linked to for your Linky Party was at about the 6 month point after adoption. We are now at the year and a half mark, and I have so much more to add to our story that I haven't written yet. I will get to it at some point. Have a wonderful Thanksgiving with your family. Audrey - So good to hear from you again. I know you must have your hands full (people say that to me all the time), but I look forward to reading more about John's progress when you get time to write. I just re-read the article you linked. I think I read it back when you first wrote it. Thanks for sharing it here. You really did paint a picture of what it's really like.